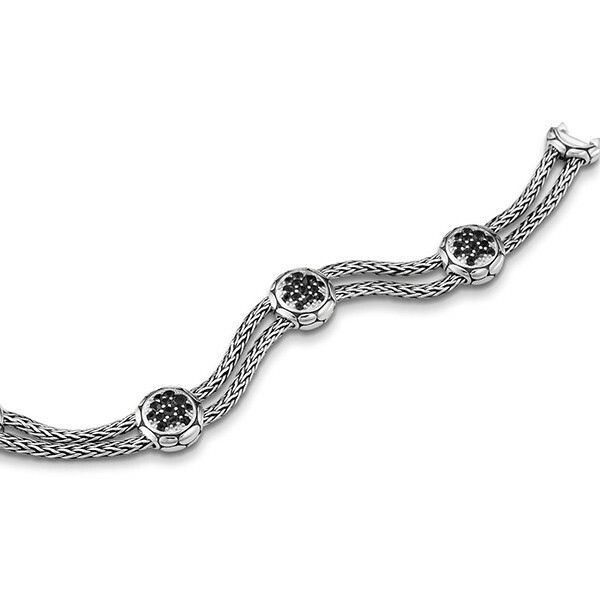 This sophisticated sterling silver bracelet comes from the Kali collection by John Hardy. A double row of John Hardy's classic woven chains link four black stations together. Each handcrafted station contains a small circle of sterling silver edged with the pebble motif and embellished with stunning black sapphire stones. The clasp is hidden as one of these stations producing a streamlined effect. Any woman would want this luxurious John Hardy bracelet in her collection! Wrist Size 6.0" - 6.5"